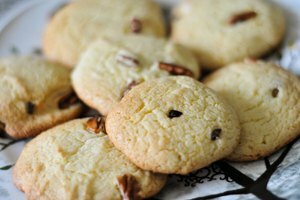 Sugar cookies appeal to a wide audience because of their simple sweet, vanilla flavor. Sugar cookies can also be shaped and decorated for any possible occasion or celebration, proving to be a fun and interactive activity for kids too. 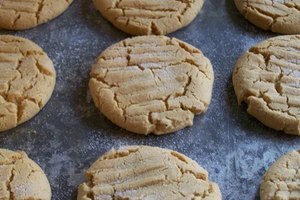 A classic sugar cookie includes flour, butter, eggs, sugar, leavening and, usually, vanilla extract. 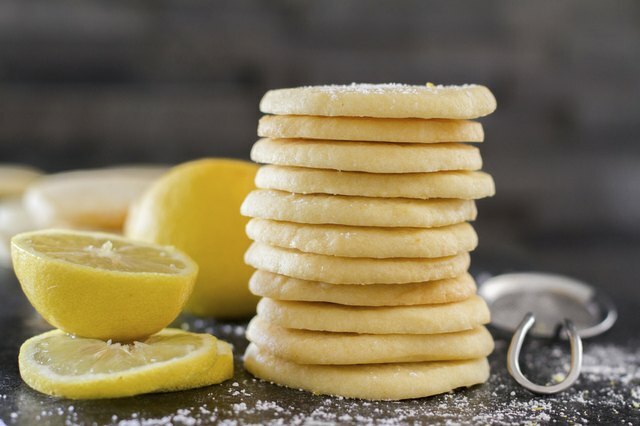 Even if you're fresh out of vanilla extract, you can whip up a batch of puffy, delicate sugar cookies to serve dusted with sugar or decorated to celebrate whatever the occasion might be. Try swapping in cinnamon sugar, vanilla sugar or vanilla instant pudding to the cookie dough while mixing to achieve a similar taste to that of vanilla extract. Sift the flour and baking soda into a large bowl and set it aside. Use an electric mixer on low to medium speed to cream the eggs and sugar; the mixture should turn a light yellow and have a fluffy texture. Beat in the eggs and flavoring extract or vanilla paste until fully incorporated. Put the mixer on a low speed, and add the flour mixture gradually, approximately a cup at a time. Scrape down the sides of the bowl to ensure the batter is fully mixed. Shape the dough into a flattened disc; wrap it in plastic wrap and refrigerate for two hours. Remove the dough from the refrigerator and shape it into one and a half inch balls. Place the cookie dough balls on a greased or lined cookie sheet roughly two inches apart. Bake for six to eight minutes until the cookies are lightly brown in color. Transfer the baked cookies to a wire rack to cool. If decorating with icing, allow cookies to completely cool before icing to prevent the icing from melting and running off the top of the cookies. To use the dough for rolled and cut cookies, shape the batter into two discs. Leave one in the refrigerator until you've rolled out the first batch. For simple sugar cookies, slightly flatten the dough balls and sprinkle with decorator's sugar before baking. If you plan to frost, glaze or decorate the cookies, cool them completely first, or the icing may melt. Flavored extracts tend to have a more intense flavor than vanilla extract. To avoid an overwhelming flavor, consider adding almond, coconut or citrus extracts in just one-quarter teaspoon increments at a time, and mix thoroughly. 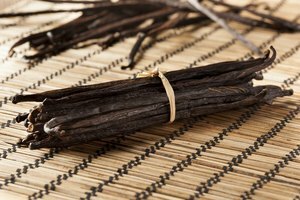 Almond extract tends to be a popular substitute for vanilla extra because it lends a familiar homemade taste like the flavor of vanilla. When adding extract, taste the batter after each addition. If you do plan on sampling the batter, use pasteurized eggs to avoid potential exposure to food-borne illness. Another way to add the flavor of vanilla to sugar cookie dough without vanilla extract is to use vanilla sugar. Vanilla sugar can be made easily at home when the sugar called for in the recipe is placed in a self-sealing bag with two scraped vanilla bean pods. Allow the sugar to sit in the bag with the vanilla for up to two days for the sugar to fully absorb the aromatics of the vanilla. This will lend at least the smell of vanilla, though the taste may not be particularly strong.